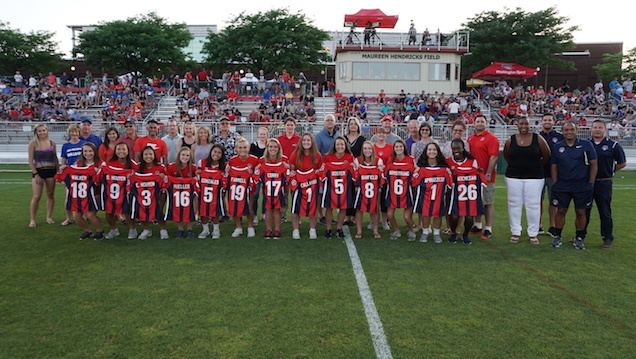 Boyds, MD (June 19, 2018) – The Washington Spirit Development Academy honored 13 graduating high school seniors during halftime of the Spirit’s NWSL contest against Seattle Reign FC on Saturday night. Of the 13 graduating seniors, 11 plan to continue their soccer career on the collegiate level. Eight of the seniors play for the Virginia DA club while the other five have played with the Maryland DA team. Morayo Adenegan (#26-Maryland DA; Notre Dame Preparatory School) – Plans to play soccer at Drexel University. Was escorted by her mother Robin Adenegan. Peyton Apruzzese (#1-Maryland DA; Severna Park High School) – Plans to play soccer at the Community College of Baltimore County-Essex. Was escorted by her father Aaron Apruzzese and mother Christina Apruzzese. Izzy Armstrong (#6-Virginia DA; George Mason High School) – Plans to play soccer at Radford University. Was escorted by her father Scott Armstrong and mother Sue Armstrong. Amanda Banfield (#8-Maryland DA; Paint Branch High School) – Plans to play soccer at Seton Hill University. Was escorted by her father Mark Banfield and mother Kathy Banfield. Hannah Boster (#5-Virginia DA; West Potomac High School) – Plans to attend school at the University of Virginia. Was escorted by her father Phil Boster and mother Maryanne Boster. Ella Callahan (#1-Virginia DA; Robinson Secondary School) – Plans to take a gap year at Rønningen Folk School in Norway while continuing collegiate soccer. Was escorted by her friends Griffin Knarr and Clare Davis. Isabella Corry (#17-Virginia DA; Washington & Lee High School) – Plans to play soccer at the College of New Jersey. Was escorted by her father Charles Corry and mother Erika Corry. Natalie Farrell (#19-Virginia DA; James Madison High School) – Plans to play soccer at Johns Hopkins University. Was escorted by her mother Kim Farrell. Jillian Gonzales (#5-Maryland DA; Wootton High School) – Plans to play soccer at the United States Military Academy. Was escorted by her father Jay Gonzales. Lauren Mueller (#16-Virginia DA; Bishop Ireton High School) – Plans to attend school at the University of Wisconsin. Was escorted by her father Donald Mueller and mother Kathleen Mueller. Emma Nguyen (#3-Virginia DA; Jeb Stuart High School) – Plans to play soccer at Davidson College. Was escorted by her father Tom Nguyen. Sarah Nguyen (#9-Virginia DA; Jeb Stuart High School) – Plans to play soccer at the University of Richmond. Was escorted by her mother Ashley Nguyen. Alice Walker (#18-Maryland DA; Poolesville High School) – Plans to play soccer at the University of North Carolina-Asheville. Was escorted by her father Chris Walker, mother Cherie Walker, and friend Haley Harkins.